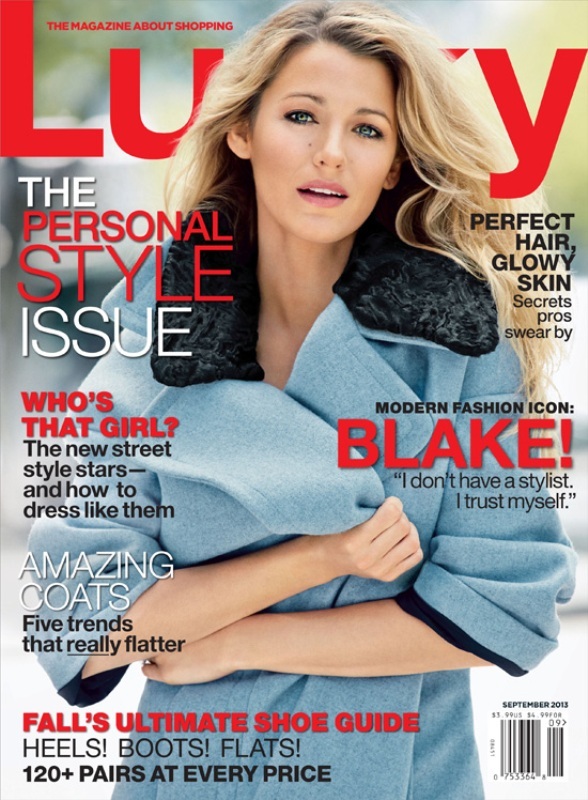 Blake Lively’s LUCKY cover has been released. I wish with magazines we could see the closed-mouth version of the open-mouth version photos they choose so that we can be enlightened on why open-mouthing is preferred. Yes, yes. We know. We keep hearing this over and over again. And seeing the evidence. What happens when Blake is styled by the team of Eva Chen, LUCKY’s new editor-in-chief, a protégé of Anna Wintour? As I wrote a few weeks ago, this is Chen’s first issue in the job, and Anna called in one of her favourite girls to help out. From what we’ve seen so far, the look is good. I particularly love the second shot attached of Blake in an oversized sweater over a Givenchy skirt and boots. SO MUCH. The interview itself doesn’t seem all that interesting. It’s Blake, after all. I said of Ryan Reynolds’ recent article in Details that it was the white picket fence of celebrity interviews. That pretty much characterises their relationship. But his wife does have more game. Blake, as you know, hasn’t worked in a while. How does she explain it? It’s a rationale for the MiniVan Majority. How could they disagree?! Remember, she’s all about her kitchen and baking cookies now.